Additively manufactured components often require temporary support material to prevent the component from collapsing or warping during fabrication. Whether these support materials are removed chemically as in the case of many polymer additive manufacturing processes, or mechanically as in the case of (for example) Direct Metal Laser Sintering, the use of sacrificial material increases total material usage, build time, and time required in post-fabrication treatments. The goal of this work is to embed a minimum allowable self-supporting angle within the topology optimization framework such that designed components and structures may be manufactured without the use of support material. This is achieved through a series of projection operations that combine a local projection to enforce minimum length scale requirements and a support region projection to ensure a feature is adequately supported from below. The magnitude of the self-supporting angle is process dependent and is thus an input variable provided by the manufacturing or design engineer. The algorithm is demonstrated on standard minimum compliance topology optimization problems and solutions are shown to satisfy minimum length scale, overhang angle, and volume constraints, and are shown to be dependent on the allowable magnitudes of these constraints. Preliminary results of this study were presented at the 15th AIAA/ISSMO MAO Conference at Aviation 2014, June 16-20, 2014, Atlanta, Georgia, USA; and at WCSMO-11, June 7-11, 2015, Sydney, Australia. 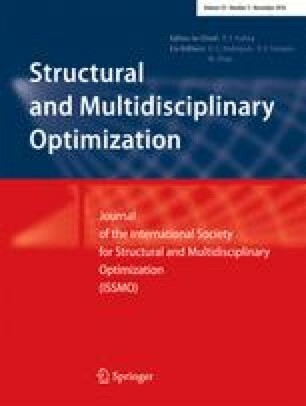 The authors dedicate this paper to George Rozvany, Founder President of the International Society for Structural and Multidisciplinary Optimization (ISSMO) and Founding Editor of Structural and Multidisciplinary Optimization, for his tremendous, pioneering research in the fields of structural and topology optimization, and for his friendship and support of the senior author. This research was partially supported by an appointment of the first author to the Postgraduate Research Participation Program at the U.S. Army Research Laboratory (USARL) administered by the Oak Ridge Institute for Science and Education through an interagency agreement between the U.S. Department of Energy and USARL, and partially supported by the US National Science Foundation under award 1462453. The authors also thank Krister Svanberg for kindly providing the MMA optimizer code. Any opinions, findings, and conclusions or recommendations expressed in this article are those of the authors and do not necessarily reflect the views of the National Science Foundation, the Department of Energy, or the Army Research Lab.